Ruskin Bond, an Indian author of British descent, is an eminent contemporary writer. He prolifically authored inspiring children’s books and was awarded the Sahitya Akademi Award to honor his work of literature. Born on May 19, 1934, in Kasauli, India, he was the son of Edith Clarke and Aubrey Bond. He lives with his adopted family in Landour, in Mussoorie, India. The Indian Council for Child Education has recognised his role in the growth of children’s literature in India. The Room on the Roof, The Blue Umbrella, A Flight of Pigeons, Rusty the boy from the Hills and A Handful of Nuts are the few of his books that make him a gem in the literary world! 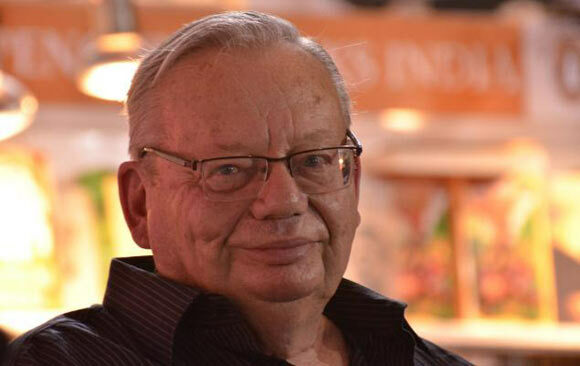 Ruskin Bond has also been awarded Padma Shri and Padma Bhushan for his works. What catalyzed your interest in writing? Is nostalgia a better trigger for you than the reality of today? I enjoy writing about the past, but the present is after all fashioned by the past. So, both are important. Do you consider writing as the means to escape the harsh reality that life throws at us? Has the Indian literary scene changed over the last few years? Yes, it has changed considerably, partly because of these literary meets. Now more young people are wanting to be writers and are writing well. So, now there are far more writers than before , and there are far more publishing companies now. Although, publishing is looking up, book selling is going down for some reasons. Though there are contradictions there. What are your views on censorship of books in India? Over the years, we did not have many books censored in India. Books are censored for political, religious and various other reasons, where the authorities thought that it could be inflammatory in some regions. The book ‘Nine Hours to Rama’ by Stanley Wolpert portrays Godse’s life shortly before and after he had assassinated Gandhi. The book was turned into a film, but was never released. The book was also banned in India. But later when I got hold of a copy of the book, I thought that the book was perfectly harmless. Although the book is still not available, one can order it online and easily get it. In ‘The Room on the Roof’, you portrayed how important friendship is in your life. What inspired you to write it? I was only seventeen years old when I wrote ‘The Room on the Roof’, and took a couple of years to get it published too. Of course even then I had a full time intention of being a writer, but, what can you possibly write about at that age? You’ve got only fifteen to sixteen years of life experience. So, I wrote on my life but fictionalized my writing to a certain extent. When I had just gone to England, and was feeling very homesick for India, I started writing a diary. When I wanted to write something, I wrote on the diary, which later became the primary basis of my first novel. I took my story to several publishers out of which three or four had rejected it, until I finally found a sympathetic publisher to publish my story. Even then I had to write two or three drafts, before it finally got published. I worked harder on my first novel than I have done anywhere else. (Laughs). Tell us something about your favourite poem and book that has touched you very deeply. My favourite story is ‘Typhoon’ by Joseph Conrad. It is a very thrilling story. The story is about a storm at the sea, and there is a ship that is going from Singapore to Hong Kong in a typhoon. It was an old, rattled ship that could have perished in the storm, but the captain of the ship was single-minded and was determined to get to his destination, irrespective of the hurdles in front of him. But after he safely reaches harbor, he gets no reward or credits for that. The captain did not care about awards and was satisfied with whatever he has done. However, I don’t like the long stories by Conrad, but his short stories are very good. Some people claim to be Gods and God-men. What is your view on that? When you are creating something, you are definitely not God. You can contemplate yourself as God-like, but not God. Humans can never become God. In the film ‘Junoon’ (1978),alongside the craftsmanship, the language differed from the book it was originally written in. Do you believe that it affects the essence of the story? ‘A Flight Of Pigeons’ is obviously written in English, whereas the narrator in Junoon speaks in Hindi and a little bit of Urdu. I always write as simply as possible, so that when people read the book, can easily enjoy it. It was a story set in couple of decades back, and I didn’t want to make it too remote or too academic. But since films in Bollywood industry are largely made in Hindi, so the story had to be rendered in Hindi. It is a common notion that an author receives great validation and appraisals if his/ her books are turned into films. Do you believe that in today’s time, movies validate an author’s creative work? It all depends on the film. There have been some great films based on books and there have been some terrible films based on literary works. But as far as my own story go, ‘A Flight Of Pigeons’ is not one of my most successful books. Although this book was published by Penguin, it barely sold 1000 copies in the last 25 years…whereas some of my children’s books have been sold in lakhs. So, it doesn’t really mean that if a book is turned into a film, that it’s going to make the book a popular one. ‘A Flight Of Pigeons’ still remains one of my lesser known works, though it has always been one of my better ones. Do you think that some more of your books could have been turned into movies, but did not happen? Did you really meet the girl whom you have mentioned in ‘The Eyes Have It’? Your book ‘Susanna’s Seven Husbands’ is very different from all the genre you usually write in. What inspired you to write it? The character of Susanna was inspired from a real lady who lived in the outskirts of Chinsura. She was a very rich, wealthy lady, who was reported to have married 7 times. Most of those men who married her were fortune hunters and she claimed to dispose them in various intricate ways, such as by introducing a cobra in her husband’s bed and in similar ingenious ways. She was the female version of ‘Bluebeard’. She got rid of 7 terrible husbands. (Laughs) Although the storyline of the film (‘7 Khoon Maaf’) was changed in various ways. The film was not quite similar to the book. You are the classic example of what Picasso had said,” It takes long time to grow young.” What keeps you motivated and gleeful at this age? Do you believe that with the advent of e-books, the pure essence of physically holding a book and reading it, is somewhat tarnished? The selling of books aren’t going down, but the means of selling are changing as more and more people are buying books online, resulting in some of the bookshops to close down. I won’t say that fewer people are reading. But you see, reading has always been in the minority part. Even when I was a schoolboy, only 3 students out of 30 would read books. And even in those days, there were no television or internet, and people still refrained from reading. But since now there has been a tremendous increase in the number of young educated people, so in terms of number, even the ‘small percentage’ of readers are very big now. This resulted the publishers to publish books and sell them, because now there is a larger market. What is the one thing that is absolutely essential in order to become a good author? Apart from having a creative mind, the primary thing in order to become a good author is that, you should have a good command over the language. Language is always important, because it is the means through which you are going to communicate with your readers. Whatever language you choose to write in, whether it is Hindi, English or Bengali, you should have a good mastery of that language. Once you gain the mastery of the language, you can easily experiment and play with words and create beautiful sentences, or even create an atmosphere and give effects. Mastery of the language is very important in order to create an atmosphere of the story. Your advise for aspiring authors.